Lay the aluminum Install University shift plate cover over the opening. Align the plate with the existing self tapping holes around the perimeter of the opening. Make sure at least five of the holes are aligned. Safety Glasses and appropriate eye protection should be used! Aluminum will fly everywhere so take appropriate precautions. 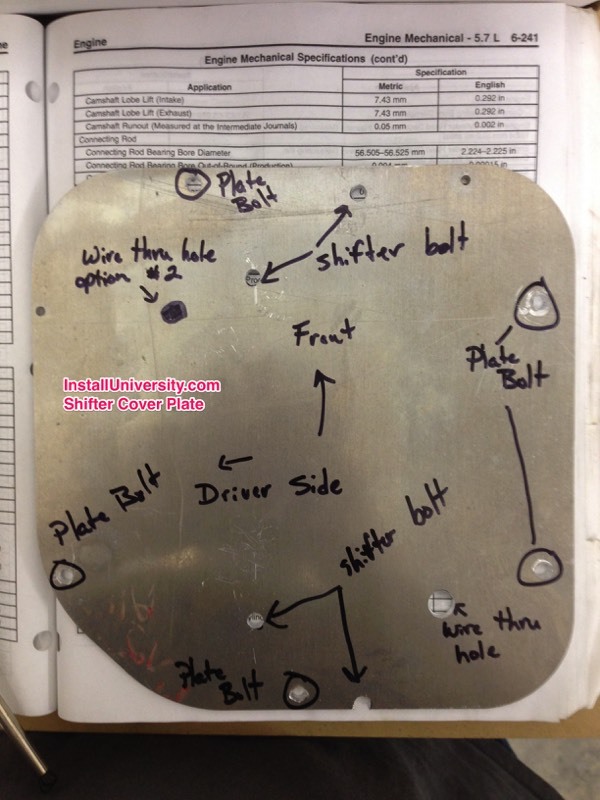 Drill out the holes you wish to use to mount the plate using a 3/16" drill bit. Hand tighten the shift cover plate. 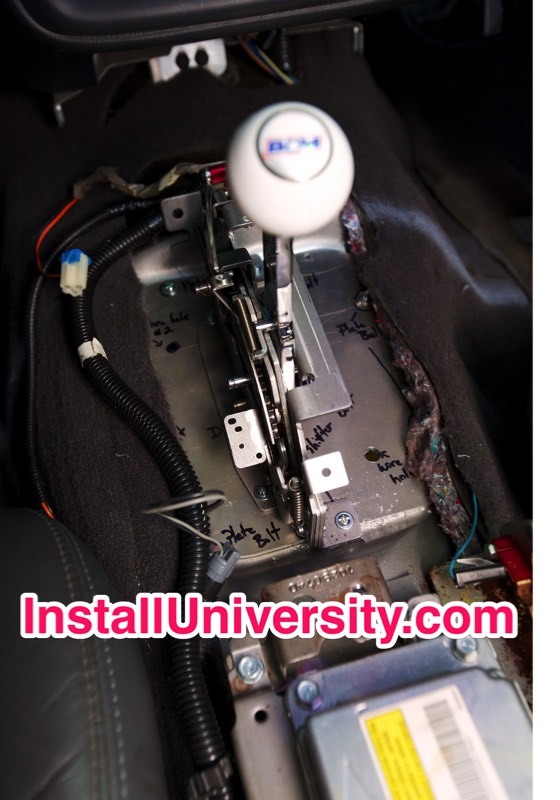 Place the shifter on the plate and then install the console (just snap it in, no bolting) ensuring a comfortable fit for you and your shifter. I had to trim the underside of the top console piece near the front of the car to allow enough space for my shifter to fit without any hassle. 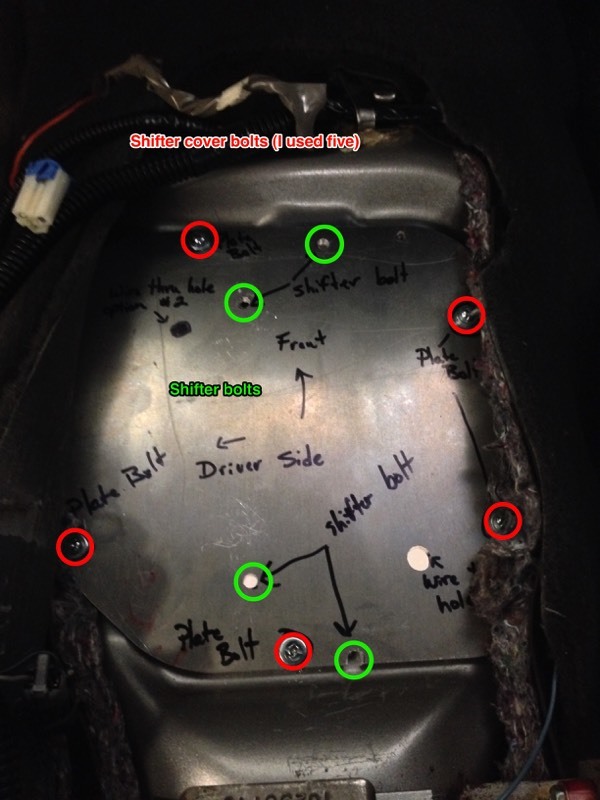 Use a marker to mark the bolt hole locations for the shifter to shifter plate cover. Remove console and shifter and drill out the shifter plate. This would also be a good time to drill an access hole for a transbrake and transmission fluid temperature gauge to easily pass through the cover plate. A garage buddy will make this go much faster. Tighten down the shifter cover plate bolts. The nice thing about aluminum is that it will bend some to better fit the opening. Tighten down the shifter bolts.